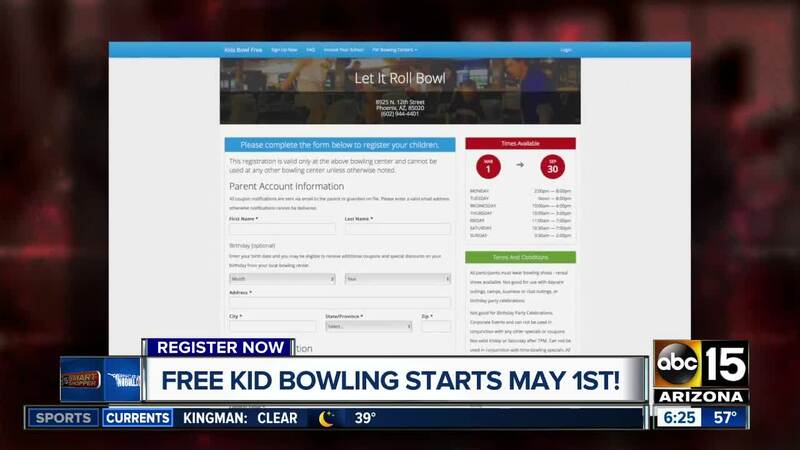 FREEBIE ALERT: Register your kids to bowl twice a day for free through summer! Sign your kids up to bowl for free over the summer! I know we are either still in or just made it through Spring Break, but it's time to start thinking about summer! Kids 15 and under can score two free bowling games daily starting May 1 with the Annual Kids Bowl Free Program! Each location has different end dates and specific times to enjoy the freebie. For example, the location in Phoenix (Let it Roll Bowl) runs from May 1 to September 30. The one in Glendale (Glenfair Lanes) runs from May 1 to October 31. There are several location options across Arizona and the Valley. Click here to see all the locations. So, what all do you have to do to get the freebie? You do have to pay to rent shoes while you bowl. Overall though, this deal is valued at $500, and you're getting it for FREE just by registering. Once you click on a location you want to register, you will have to enter contact information, including your child's name, birthday, your phone number, address and email. You will be sent a confirmation email. After you register your child, you will be provided with options for the family if you have older kids or more adults who want to bowl. Here's where the money comes in. If you want to add one adult to bowl with the free child game, that price is around $22. If you have up to four adults, it's $37. The perk is this is a one-time fee so the adults and kids can bowl together two times a day through the valid dates. That deal is valued at $1,500, and you're paying less than $40! And, you don't have to bowl. You can just go watch your kids enjoy it for free! Be sure to register now to make sure you don't miss the deal! We are waiting to hear more information about the Spring Play Pass . This is a separate bowling discount for Bowlero, AMF, Brunswick Zone and Bowlmor. We were told it starts in April. In the past, you paid a standard price, and the pass allowed you to play two games per day, including shoes for three weeks from the date of the purchase. When we get the details, we will add it to this article so you can bowl for less through spring AND summer! We hope you enjoy all the strikes and savings!